Referral courses can be done if you have completed your pool and theory dive training at home at your local dive shop. 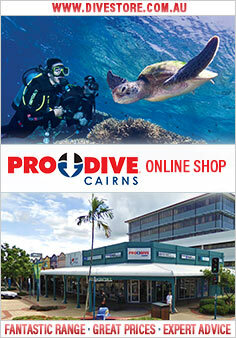 Once you come to Cairns you can finish your course on the Great Barrier Reef. This is a great option if you don't want to spend two days of your holiday with pool and classroom training. The PADI referral course is conducted onboard Deep Sea Divers Den's 3 day 2 night liveaboard trip to the outer reef. Their liveaboard vessel, OceanQuest, is permanently moored on the reef and they use their day vessel, SeaQuest, to transfer passengers to and from OceanQuest. Accommodation onboard is in Double or Twin share cabins (see below for pricing). Day 1: The Deep Sea Divers Den bus will pick you up from your Cairns city accommodation between 7:30am - 08:00am - time dependent upon where you are staying. You will be transferred to the outer reef aboard SeaQuest and do your first 2 training dives. At 2:30pm you will be transferred over to OceanQuest where you will spend the night. Lunch, dinner and accommodation included. Day 2: Two further training dives with your instructor, followed by your PADI Open Water diver certification! In the afternoon you will have the opportunity to do your first dive as a certified diver. A guided night dive is also offered. Breakfast, lunch, dinner and accommodation is included. Day 3: Three more pleasure dives in the morning before being transferred back onto SeaQuest for your trip back to Cairns. You will arrive in Cairns at around 5pm for your transfer back to your Cairns city accommodation. Breakfast and lunch included.